Have you tried replacing the supercap? Could be the fault I mentioned a few posts above. That's a fault condition, not a circuit design error (the case with the wire patch). I haven't tried to replace the supercap as I was going on the assumption that if it was faulty then other settings would be lost or corrupted after powering off, and that isn't the case. At least that's how I see it - what do you think? Game settings are stored in a EEPROM. Nothing to do with the supercap which keeps power only for the volume control IC. Ahhhh, I see. I had stupidly assumed that the supercap was keeping power for all settings. I'll see if I can source a replacement then - I usually order my electronic components from Farnell or RS so hopefully they'll have something suitable. I'll open up the shell of the A board again tomorrow and check the existing supercap's values. Update: Replacing the supercap fixed the volume settings problem. Thanks for your help. 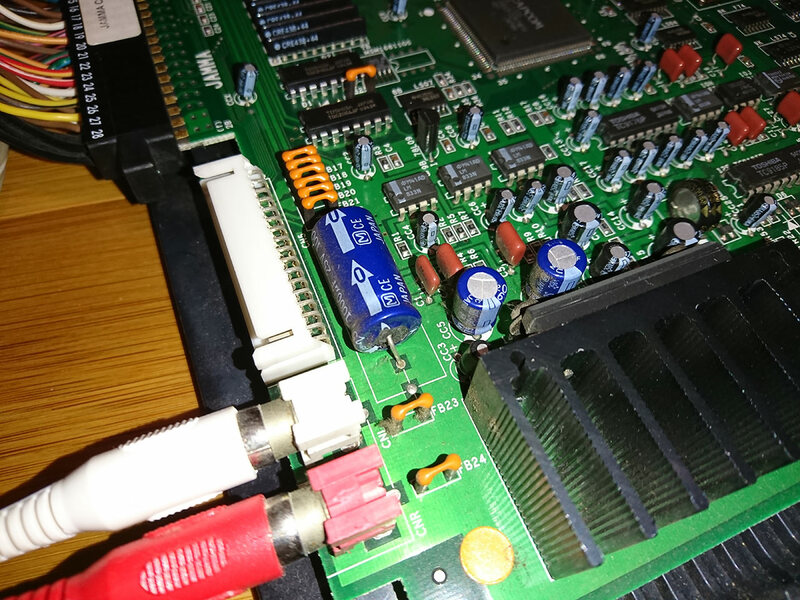 I have issues with my SFZ3 980629 CPS2. I plugged it yesterday (haven't used it for a few years) and the sound was very low (RCA as well as JAMMA). I think i already had this issue, and maybe the VOL- hold during power fixed it (but can't remember for sure). I tried several time but it doesn't change anything. I also uplugged/replugged the A/B boards. The volume shown in the test menu is "39" (max). I made a reset. Also, is the TEST button supposed to do something ? Because the three buttons doesn't do anything. I tried again today, and after a few try, i don't have sound at all anymore. Do you think i can try to change this "supercap" ? I opened the A-Board and everything looks pristine. The supercap just keeps the settings saved. Unfortunately that won't help you, since your problem is that you have no audio at all. Your problem is a faulty amp, op amps or caps. Thanks. I checked my PSU (blast city) voltages and they are fine. I hope the PSU is not frying everything because my gdrom also start only when he want to. This is pictures of my A-Board. I will try to buy another to make tests. Is there anything i can try to troubleshot with my multimeter ? So technically you could test this just by removing the super cap. OK i thought the biggest was the "supercap"
I shorted the M cap (it was at 3.6v) until it gave almost 0.05v but still no sound when booting. I will buy another board to check the game. 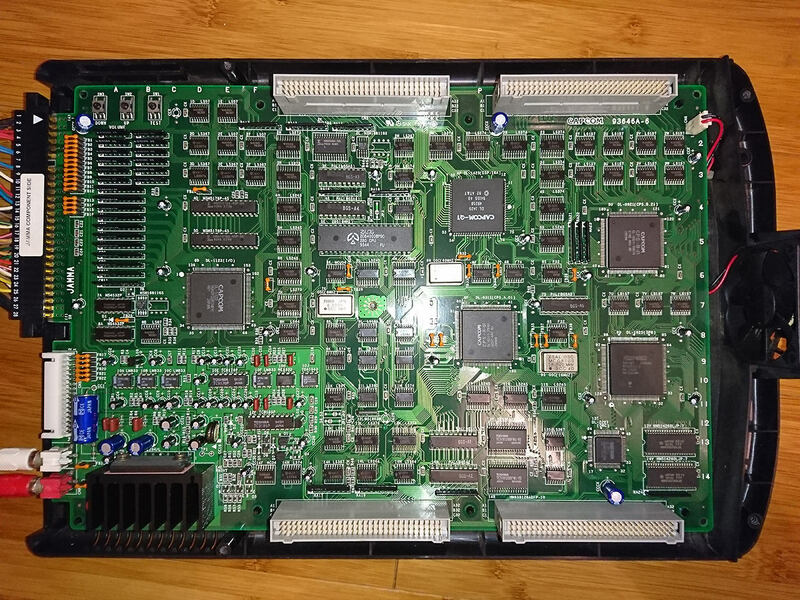 Anyone around fixing CPS2 in europe ? The supercap is part of the audio circuitry only, has no effect on other settings. Your problem is likely the supercap. I got a new motherboard and the sound is working. I wanted to be sure the game was ok before bothering trying. I will try to remove the cap. edit : i noticed the TEST side button was also working on the new a-board. (it was not on my defective a-board but nobody told me if it was normal or not). Where to find replacement switches ? PS : picture of the new a-board, is this any better than my old one (picture few post above) ? seems to be a newer rev. 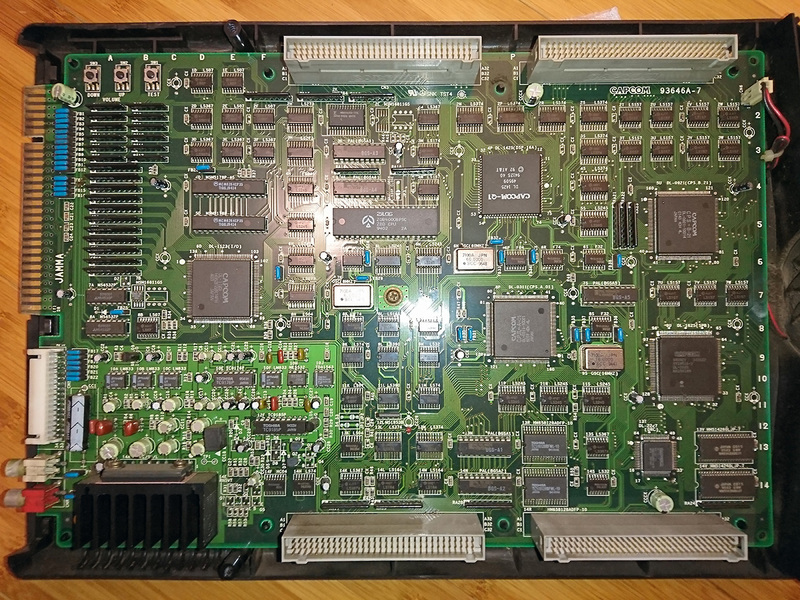 So, the original A board actually works fine, with the exception of your test and volume buttons on the board not working? Yes. It seems suspicious that all three switches are dead but it looks like it. Look into the ground connection. Who knows, it might be cut at some point before the buttons. That could explain it. If it works, you know your switch is shot. "Sin and death's got the whole world gettin' illa, but I praise God for the Blood Spilla."